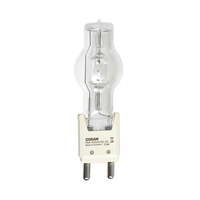 The OSRAM HMI 4000 W/SE is a "single-ended metal halide lamp" with outer jacket and a G38 base. Featuring eXtreme-Seal Technology, the lamp withstands pinch temperatures up to 450°C. This lamp is mainly used in film and TV lighting, as well as for stage, studio,and industrial solar simulation.